Ever wondered what it takes to be a food writer? Want to brush up on your food blog skills? Need help figuring out how to caption that photo of brunch you just posted on Instagram? Join Camas Davis, former editor at Saveur and Portland Monthly magazines, founder of the Portland Meat Collective, and author of the forthcoming memoir, Killing It, (Penguin, 2017) for this immersive introduction to food writing. 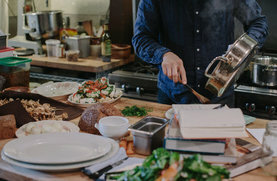 During this 3-hour class, Camas will team up with photographer Robert J Hill, who will provide us with photographic inspiration, while Chef Jason French of Ned Ludd will ply us with beautiful and delicious food and drink. As we eat and drink our way through the afternoon, we'll swap opinions on our favorite food writers, we'll brainstorm story angles, we'll explore narrative form, and we'll definitely put pen to paper (or fingers to keyboard). We'll also delve into the important relationship between food photography and food writing. With fork, knife and pencil in hand, we'll traverse the current food writing landscape, from print to digital, from social media to public relations, from feature-length magazine stories to quick blog posts. Come join us for this culinary exploration of the written word.